Hi, everyone! My name is Leanne and I blog at Devoted Quilter (devotedquilter.blogspot.com). 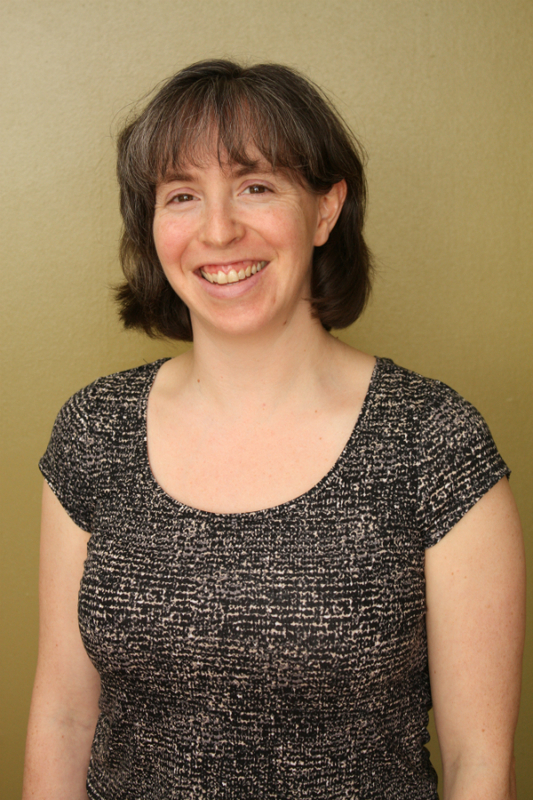 I grew up in Nova Scotia, but I now live in Newfoundland with my husband and our three sons. We also lived in Igloolik, Nunavut for 6 years after we got married. I started quilting in university (at Acadia) almost 20 years ago, when I decided to make a quilt for a friend as a wedding gift. I started small...or maybe not...the quilt I gave her was almost double bed size, had tons of hand applique and hand embroidery and was hand quilted! 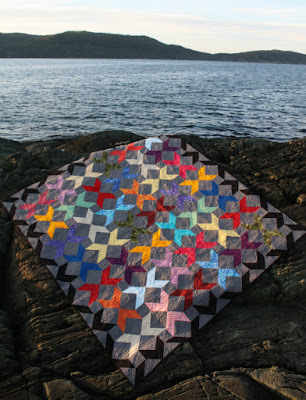 Crazy, I know, but it got me completely hooked on quilting. 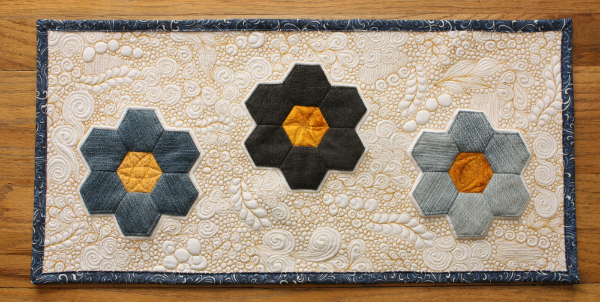 For years I hand quilted everything, which took f.o.r.e.v.e.r. I have one quilt I made my oldest son that took me 6 years to finish, and most of that was because of the quilting. Well, actually, it was because I kept abandoning it for months at a time to work on other things that weren’t taking so long. 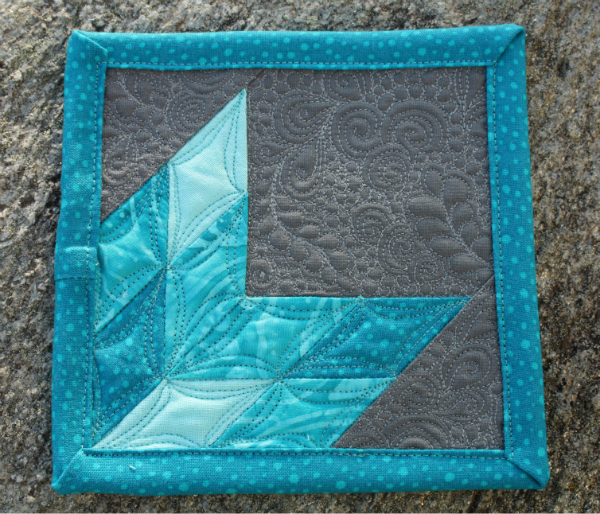 Once I tried machine quilting, there was no turning back! 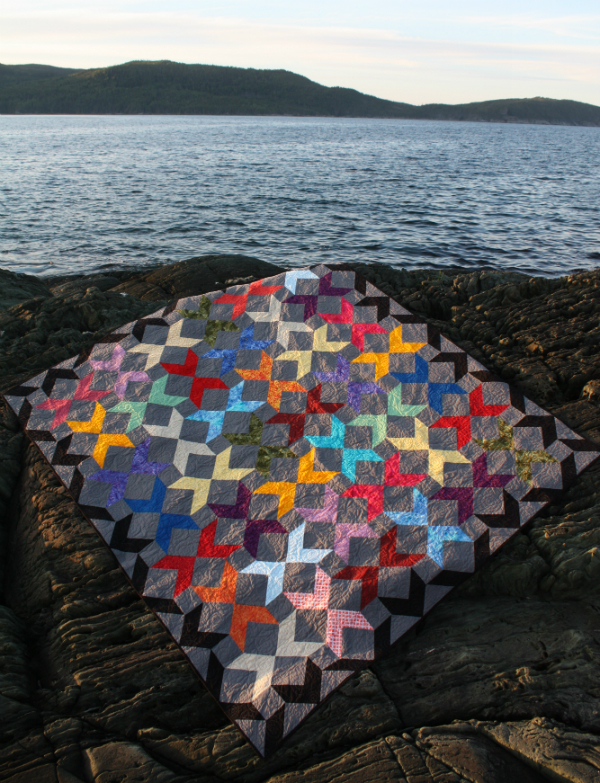 Now free motion quilting is my absolute favourite part of the whole quilt-making process. 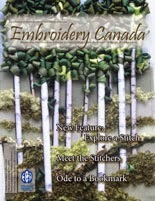 Being a part of the online quilting community has been amazing. I love having so many friends around the world who are as obsessed with fabric and making things as I am. It has been especially fun to exchange mini quilts and mini mini quilts with some of those friends. 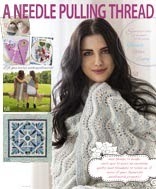 It took almost 20 years, but I finally made a quilt for our bed last spring, and the pattern, Love Birds, was published in Make Modern magazine. 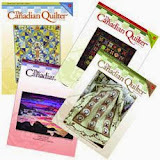 I have had a few patterns published in magazines over the past couple of years, and I also sell PDFs of my patterns, none of which would have been possible without the online quilting community. 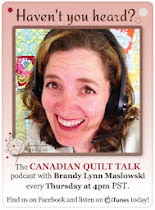 I also challenged myself to host a mystery quilt-a-long, called Just the Basics, in 2016 and that was a lot of fun. All of the instructions are still available on my blog, so you can check that out if you’d like to make it too. I have so many plans for things I want to make and share, it’s hard to keep myself from starting something new every week! Quilting can be addicting! I have had many hobbies over the years but quilting has been the one that I go back to time and time again. Thanks for introducing yourself. 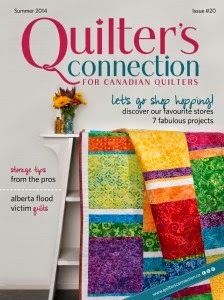 It is great to get to know quilters from all over Canada. We sure have a lot of talent in our Country! So nice to meet you Leanne. Seems we have a few things in common. I grew up in Nova Scotia and I lived in Yellowknife for five years. Did get to Frobisher Bay, as it was called, to teach a course. I follow you on Instagram.